During this season of celebrations, seasonal concerts and parties, the subject of holiday traditions inevitably comes up. At a recent party, a friend admitted she had a number of tangible Christmas memories hanging around her place. Her closet Christmas skeletons comprise a collection of Christmas sweaters. Her husband’s mother gave him a new one every year for years—the tackier, the better, of course—alongside a nice bottle of something and a nice box of something else. When his mother died, the tacky-sweater gifts ended. Now, some people might think that having a collection of ugly Christmas sweaters in a nearby closet presents great opportunities. Tacky Christmas sweaters have acquired recent respectability, shifting from good-natured duty-wear to a celebration of homey homeliness. After enjoying a brief moment as an expression of hipster counter-culture, the ugly snowman/reindeer/Santa sweater has evolved into a tradition embraced by families. So embraced that some sweaters have recently sold for as much as $US 300 on eBay. 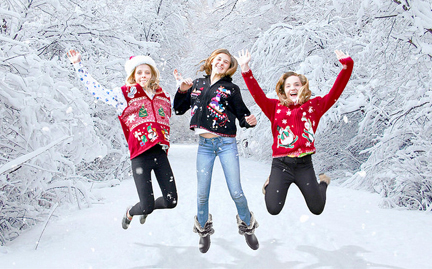 UglyChristmasSweater.com,one of the biggest sellers of intentionally hideous holiday sweaters, started in late-2012, now employs 30 people and expects to sell $US 5.5 million worth of ugly sweaters this year. According to the Vancouver region’s nowthatsugly.com, the ugly Christmas sweater movement “is about basking in the warmth of a hideous sweater, having fun, doing good, and creating smiles.” The organization hosted an Ugly Christmas Sweater Dash in Port Moody December 5 to raise money for the Children’s Wish Foundation of Canada. Its Original Ugly Christmas Sweater Party happens on December 18, with prizes for the ugliest sweater, most original sweater, best moustache, and group costume. A number of offices also hold annual ugly sweater contests. There’s nothing like ugly-Christmas-sweater show-and-tell to bond office workers—a form of Christmas-fashion True Confessions. I suggested I help relieve my friends of one or two of their skeleton sweaters—you know, just to be helpful, as the tradition never caught on in my family. Our closets may house no Christmas-sweater skeletons, but in our household, ghosts of Christmases past linger at the dinner table. One—dating to 2012—shows up as the faintest grey crescent of a wine stain. Elsewhere on the white cotton tablecloth used for large dinner parties and meals at this time of year, another barely perceptible shadow brings to mind a friend who joined us for a holiday meal. Speaking as exuberantly with her hands as she does with her mouth, she had knocked a glass of wine flying. Near the centre of the cloth, a small, faded splotch shows where somebody once dropped some curry-seasoned dressing—which only can be from 2010. Another appears as a yellowy smudge of protein baked by heat into the cloth when the gravy boat tipped over in 2007. The ghost of Christmas 2013 dresses up as the soft smudge of a coffee stain. The ghosts greet us each year when we pull the tablecloth out and press it into service. Each has been soaked, scrubbed, sudsed, and bleached to ghostly faintness, yet they cling on, telling quiet tales of food, stories and laughter shared among friends and family. These days, we shield them from the eyes of guests under festive runners, placemats and so on. But we know they’re there. And it doesn’t matter if somebody dribbles wine, slops gravy, or lets red candle wax drip. Each inevitable spill becomes a new memory to savour at future Christmas gatherings. And, like the ghosts that we shelter under the table landscaping, the homely Christmas skeletons living at the back of my friends’ closet remind her and her husband of past celebrations, of friends and family far away or no longer around, and of food, stories and laughter shared. A version of this editorial was published in the December 20 edition of the Victoria Times Colonist.